Fan Jianjun points to a concrete pipe jutting from the lake bank. Sludge spews from its mouth and arcs across the water, the surface bubbling with the bodies of flies. Fan has lived in Houtonglong village all his 31 years. The water was clear, he says, before the pig farm was built and people's health began to suffer. No one consulted the villagers before Shengtai pig farm was built 100 metres from their homes. The farm produces 10,000 animals a year – a relatively small concern in the world of industrialised farming – but there is so much waste to dispose of, the village air is thick with the stench. In the rainy season manure escapes from the farm, covering the roads. Villagers are developing respiratory problems and Fan struggles to raise chickens and ducks, which die soon after hatching. In the 10 years since the farm arrived, the villagers have tried to get it dislodged. "We pulled down the walls several times, and blocked the gate with mud and trucks," said Fan, a self-employed businessman. Complaints to the local government have gone unanswered, so Fan turned to internet forums to raise awareness. "We can only hope the farm will stop polluting our environment," he added. "Our village was once a very beautiful place." Pork is China's favourite meat: last year the country produced 50 million tonnes – more than half the world's total – and as the disposable incomes of China's 1.3 billion people rise, their appetite is growing. "Pork is wrapped up in ideas of progress and modernity," said Mindi Schneider, a sociologist at Cornell University. Until the 1990s typical families only ate meat at Chinese new year. Memories of the devastating famine that killed tens of millions in the early 1960s still weigh heavy on the Chinese psyche. "I've heard people talking about eating meat in 'revenge,'" Schneider said. "It was so limited before. Now it's like: 'look at this progress, we can eat as much meat as we want.'" In 1980 the average Chinese person ate 14 kilograms of meat. Today that person eats over four times more, almost 60 kilograms. In comparison, the average American eats 125 kilograms of meat each year and the average Briton about 85 kilograms. The livestock industry is transforming accordingly. Seen from a hilltop 20 miles from Houtonglong, the future of Chinese pork production takes the form of 32 identical redbrick pig sheds, shaded by leafy trees. Jiahua Pig Breeding Centre is one of China's new mega-farms, producing 100,000 pigs a year. Unlike the farm in Fan's village, Jiahua is relatively isolated. But from this vantage point, the reek of manure wafts over with the wind. Periodically, the screams of dozens of pigs gather in a crescendo. 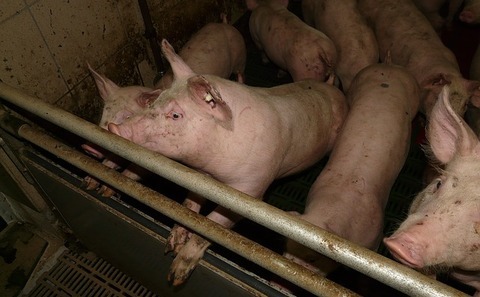 There will soon be more farms like Jiahua: between 2007 and 2010 the government invested US$1.6 billion in the construction of industrialised pig farms, and it continues to provide similar levels of support. Jiahua itself has invested US$48 million in a plant that will be three times the size of this one. Feeding a fifth of the world's population on less than 10% of its arable land is a critical issue for the government. Industrial livestock farming, the argument goes, will stabilise China's erratic pork prices through its efficiency and predictable output. But, in China's case, some dispute this assertion. "Industrial production is one of the very things that makes the price so volatile, because the cost of industrial production in China is higher than the cost in the US, because feed is so expensive since it's all imported, and there are costs associated with buying the housing and technologies," said Schneider. The growth of industrial pig farming in China has implications for the rest of the planet: the livestock industry accounts for 18% of the world's greenhouse gas emissions – more than is produced by cars, planes, ships and trains combined, according to the UN Food and Agriculture Organisation. China produces more or less the same amount of pork as it consumes, but it cannot grow enough pig feed: it takes 4 kilograms of grain to produce 1 kilogram of pork, and China is short of crops. Last year China imported 60% of the world's soya beans, which were fed to pigs exclusively. Shipping soya beans and, increasingly, corn to China affects global food prices, entails hefty greenhouse gas emissions, contributes to the razing of millions of hectares of forest, savannah and pasture in Latin America and diverts grain that could feed the world's hungry. In Houtonglong village, other forms of environmental degradation are evident. Beyond the sludge lapping the lake edge, a bloom of russet algae covers the water. A 2010 investigation by the Chinese government found that agriculture is a bigger source of water pollution than industry. "The fast development of livestock breeding and aquaculture has produced a lot of food but they are also major sources of pollution in our lives," said Wang Yangliang, of the ministry of agriculture. But the government is doing little to enforce the protection laws it has put in place. Wang Xi, a professor of environment law at Jiaotong University in Shanghai, says that while the legal system regulating the livestock industry is comprehensive, the implementation of laws is patchy. "Generally", he says, "it doesn't look good.